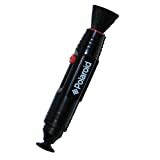 Using the Lenspen is quick, easy and convenient and nothing cleans a lens better or faster. The convenient, retractable brush, made of soft, natural bristles, is used to dust away any hard particles or contaminants. Designed for flexibility, the unique tip holds the special LensPen cleaning compound. It flexes, matching the contours of the lens. By applying gentle pressure on the lens and using smooth circular motions, any smudges will be removed instantly with Lenspen. More than just protection for the tip, the special LensPen cap replenishes the tip with more cleaning compound each time it is replaced and twisted a half turn. This entry was posted in Discount Photography and tagged Cleaner, lens, Original, Polaroid by Ball Photo. Bookmark the permalink.